Why? I love Muppet Race Mania, and no-one else seemed to have done a site for it, so here I am. OK, that's an exaggeration. 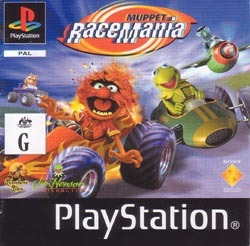 As you can quickly confirm in the links section, there are at least two official sites for this PlayStation kart racer, and there have been quite a few reviews of the game since its release in 2000. But the official Henson Interactive site used too much Flash, didn't include detailed playing hints for every level and (most significantly) is now officially defunct. The site from developer Traveller's Tales has lots of interesting preliminary graphics but not much else. This site fills in all those gaps and provides lots of detailed trivia for the obsessive Muppet fan and/or gamer. Sadly, if you want to buy the game (and I definitely recommend doing so), you'll have to try eBay or a second-hand store, as it is no longer available commercially. Other miscellaneous bits and pieces, such as the original press release announcing the game, links to other relevant sites, a brief comment on the voices in the game, the less-confusing-than-the-manual explanation of how to play, and other assorted pieces of trivia. Important note: Muppet Race Mania, Muppets, and characters were all trademarks of the Jim Henson Company when the game was released, and are now trademarks of Disney. Most of the graphics used on this site are originally from the game's official site(s); I've included them here partly to guard against the all-too-likely eventuality that the sites which first featured them will eventually be taken down, and partly because they're useful. No infringement of copyright is intended; this is purely a fan site.